With our large selection of stock banner brackets for light poles and wall mounting, you can get your banners up in no time! In-stock banner brackets usually ship within 24 hours of purchase so you don't have to wait if you are in a time crunch. All of our stock banner bracket systems come equipped with hose clamps or stainless steel banding; black banding is also available. Additionally, many of our stock banner bracket designs can be modified in length to fit different banner sizes and shapes*. View our stock banner brackets and call us at 800.395.2468 or fill out our Contact Form for ordering and questions. For displaying banners on a budget, the WindSaver Economy banner bracket can fit banners up to 72" long. The Banner Master fiberglass banner brackets feature a durable flex design and made for long term banner installations. The revolutionary design of the fiberglass BannerFlex Airow banner bracket system has proven to be the ideal solution for secure high-wind installations. 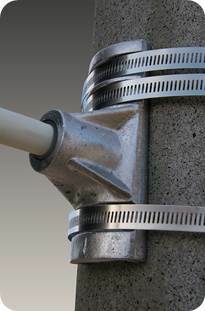 BannerSaver™ brackets allow a light pole banner to flex according to wind speed and direction. *24 hour shipping does not apply to modified or custom banner brackets.